At a special called meeting, 18 December 2014, the Mayor and City Council of Chattahoochee Hills heard resident after resident speak supportive words toward a petition to annex 4,920 acres into the south Fulton County municipality. Person after person stood up and told Chattahoochee Hills officials how they paid taxes to Fulton County, but received little or no services. These taxpayers then said they felt the City of Chattahoochee Hills could best protect the traditions and lifestyles of their families. Not one individual opposed the annexation during the 18 December 2014 public hearing held at the old school house that now serves as Chattahoochee Hills City Hall. But that did not stop the Fulton County Commission from objecting to the people-powered movement. Former Commissioner Bill Edwards, a Democrat, led the charge against the people. "We must look at the ability of the city to deliver the service," Edwards said at a 17 December 2014 county commission meeting. "I know Chattahoochee Hills. You don't have a proper fire department. We're talking one fire station, and we're talking about two police cars. "I will not put people who I govern right now into harm's way in a city that cannot deliver them the appropriate services," Edwards told commissioners. Fulton County's objection to the citizen-led petition put a temporary halt to the annexation, and sent the matter to arbitration. But now, that final hurdle has been removed. 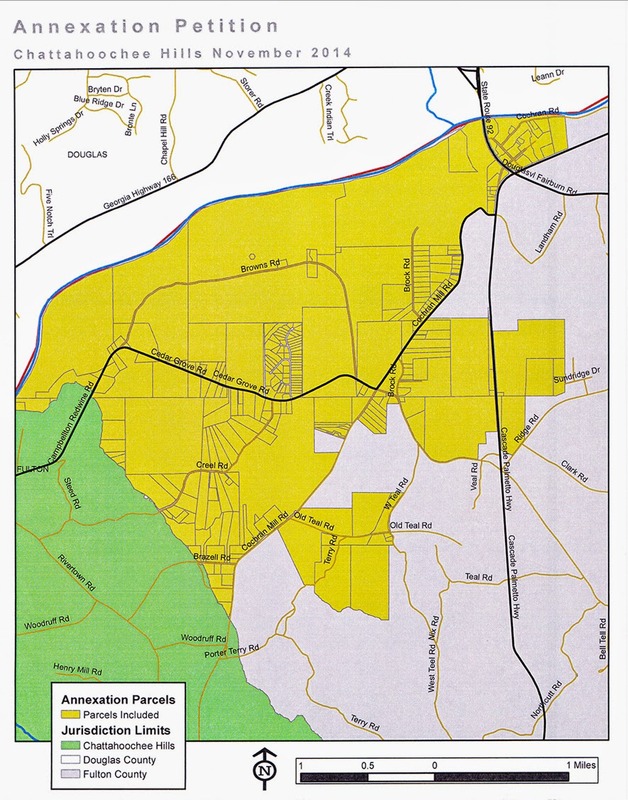 The City of Chattahoochee Hills and Fulton County, according to government documents, have reached an agreement that will allow the 4,920 acre annexation to move forward. Based upon that agreement, the Fulton County Commission will vote to remove its objection to the Chattahoochee Hills annexation. The Commission vote is scheduled for the 18 February 2015 commission meeting. Once the county formally removes its annexation objection, the Chattahoochee Hills City Council can then adopt an ordinance adding the 4,920 acres of land to the city.